Fireweed Zinc Sees Strong Buying Ahead of PEA | Energy and Gold Ltd.
One of Fireweed Zinc‘s (TSX-V:FWZ) strengths is the company’s tight share structure with strong insider ownership. However, there is also a ‘drawback’ to having a tight share structure with the majority of shares held by strong hands – the stock can be fairly illiquid. Throughout its consolidation during the last couple of months FWZ has had many trading sessions in which 15,000 shares or less have changed hands. That’s pretty thin for a C$40+ million market cap stock. This afternoon I was on a conference call with Fireweed CEO Brandon Macdonald (put together by O&M partners) and one of the investors on the call mentioned to Brandon that he was having a difficult time buying Fireweed shares on the OTC market under the symbol FWEDF. In fact, this investor claimed to be bidding $.03 higher than the last trade and still wasn’t getting filled for a single share. Of course, the answer to that problem is to buy FWZ shares on the TSX-V instead of the much less liquid and murkier US OTC market. Buyers looking to acquire shares in companies this tightly held are also usually well served to phone the company as it can often be easier to arrange a trade than to rely on the whims of the market. From a technical vantage point today’s candlestick in FWZ is extremely bullish; a large bodied marubozu after a ‘gap and run’ trading session. 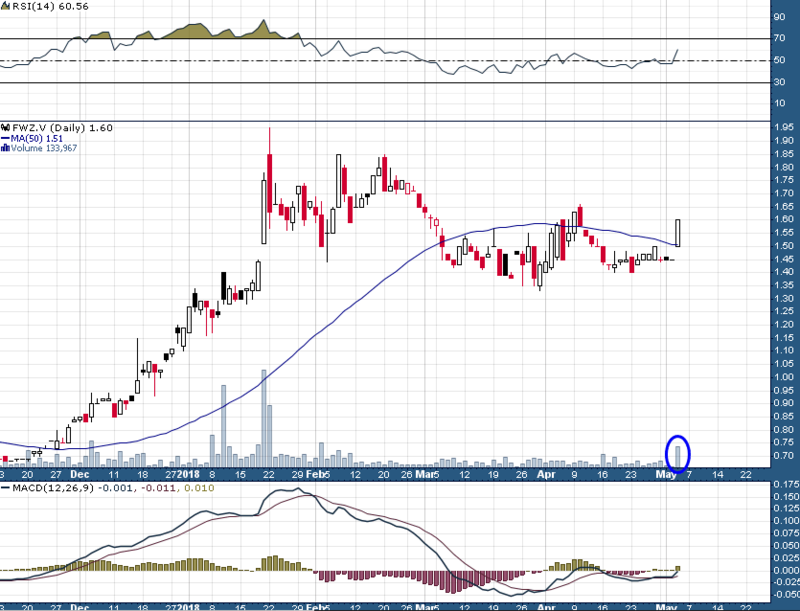 There is potential for today’s candlestick to be a bullish ‘breakaway gap’ after a two month consolidation between C$1.35 and C$1.65. With FWZ on the verge of publishing an extremely important maiden PEA there could be a run-up in anticipation of the PEA announcement. And of course if the PEA exceeds expectations we could see FWZ shares print a fresh all-time high. I am long FWZ shares and it is one of our long term holdings in the Trading Lab Model Portfolio. I would like to also add that FWZ CEO Brandon Macdonald has set an example of how a public company CEO can use CEO.ca to communicate with investors. Not only by promoting their company but also by educating and sharing their knowledge and experience. Brandon offered a particularly insightful answer yesterday to a question about insider buying. I am biased and I am bullish, and I must say i’m happy to invest my money alongside the likes of a CEO like Brandon and Executive Chairman John Robins, who lead by example and consistently work hard to build shareholder value.